Teminioluwa Ajayi, a third-year medical student at Duke, co-founded Grow with Nigeria three years ago after moving to the United States when he was 15 years old. After receiving education in the United States, Ajayi said he realized that the application-based learning model made information easier to learn than the Nigerian system. “In Nigeria, all I had to do was read some textbooks and regurgitate the information on the exam," Ajayi said. "When I came to the United States, I struggled a little bit with the practical courses because I just was not trained to think like that, to see things in the bigger context." Grow with Nigeria conducts summer programs for high school students in Nigeria with four-day experiential learning courses. 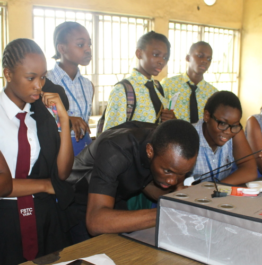 Ajayi explained that the Nigerian students involved in the program are able to take part in practical hands-on experiences across STEM fields. “The goal is to have [the students] see the spectrum of careers available to them in STEM and actually see what these professionals do," he said. "Hopefully, this program plants a little seed, and their eyes are opened to a new range of possibilities." The program's leadership team consists of eight professionals from the United States who are aided by medical students or health professionals from Nigeria for the summer. The nonprofit also recruits other local volunteers to help ensure that the curriculum is responsive to the needs of Nigerian students. Grow with Nigeria opts for a directed recruiting system in selecting its students due to logistical and financial limitations. So far, Grow with Nigeria's executive team has reached out to teachers in low-income schools for student recommendations. Like any other NGO, Grow with Nigeria has had to work hard to secure funding for operations, Ajayi noted. Last year, the company competed in the Duke Startup Challenge and was awarded $5,000. It has also attracted donors—Duke provided approximately $10,000 in equipment that the program uses, and IBM provided the space they use in Nigeria. Last year, Grow with Nigeria’s summer program consisted of four sessions—health professions, information technology, renewable energy and a professional development seminar. Students learned how to suture and perform other basic life support skills like chest compressions. They also built a robot, designed a website and constructed a solar-powered car. “We want all students to have a minimum viable product that they built themselves when they leave," Ajayi said. "This helps them demystify the career and the STEM space." Ajayi said that balancing medical school with the work of operating Grow with Nigeria can be challenging but added that he has remained committed to the organization nonetheless. “Whatever free time I have goes to Grow with Nigeria," he said. "If you’re doing something you love to do, it’s not work." Looking to the future, Ajayi said that Grow with Nigeria plans to be incorporated as a 501(c)3 non-profit organization and subsequently establish a mentorship program for previous participants. Eventually, Ajayi and his team hope to export this model into more Nigerian states and train teachers, with the broader target of redefining education policy in Nigeria.